The Brazilian with his award. NEYMAR HAS BECOME the first ever Barcelona player to win La Liga’s player of the month award, ending a bizarre drought which saw the Catalan giants consistently overlooked for the accolade. Nine different clubs had been represented on the winner’s list before this month but, quite staggeringly, a Barcelona player wasn’t among them. Despite dominating the league last year as they swept all challengers aside, members of Barcelona’s treble-winning side, including Lionel Messi, were ignored by league officials. It even led to anti-Barcelona conspiracy theories but they are finally on the board after it was announced Neymar’s prolific form was to be recognised. The Brazilian is the league’s top-scorer (14 goals in 13 outings) as Luis Enrique’s side find themselves top of the pile once again. During the month of November, Neymar found the net five times including a double against Villarreal and a strike in the Clasico demolition of Real Madrid. Announcing the news on its official website, the club hinted at its frustration towards the Spanish League for the allocation of the awards of the past two years. “Astonishingly, not only is this the first time Neymar has won the Spanish League’s player of the month award, it is the first time any FC Barcelona player has taken it home at all,” it read. Diego Costa was the first player to win the award back in September 2013 while Real Madrid have won it three times, two of which were courtesy of Cristiano Ronaldo. Ronaldo, Diego Godin, Antoine Griezemann, former Arsenal striker Carlos Vela and Nolito of Celta Vigo have all won it twice. 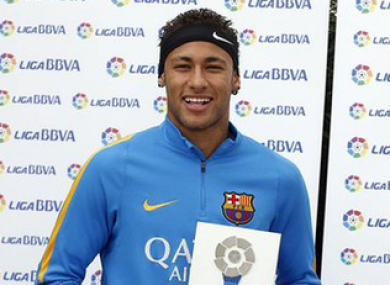 Email “Conspiracy over as Neymar wins Barcelona's first ever La Liga player of the month award”. Feedback on “Conspiracy over as Neymar wins Barcelona's first ever La Liga player of the month award”.